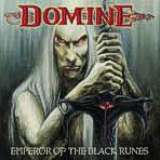 This new album from Italy's Domine is the band's 4th album and their latest release since 2001's awesome Stormbringer Ruler album. I was really impressed by that album and this new one can simply be described as Stormbringer Ruler part 2, only not nearly as good. The overall sound of this album is much like it's predecessor as are the song structures and style. For those not familiar with Domine, picture an epic Rhapsody style but with more of a raw true metal sound with Blind Guardian and Iron Maiden influences. Already released in Japan, this album should be available by the end of this month or early February. After an epic orchestrated intro, things get off to a slow start with Battle Gods Of The Universe. Sounding oh so cliche, the vocals are not very strong here and although the guitars have a great sound, the riffs are nothing impressive. The solos for this track are also weak and a bit sloppy. Things pick up a bit with the next track, Atrioch The Chaos Star, which uses more Maiden styles and is a more mid-tempo track with a much better vocal performance. Things finally get back on track with what we've come to expect from this band with The Aquilonia Suite - Part 1. An 11 minute epic, this one begins with a slow ominous tone and uses a variety of tempos from slow, heavy and reflective to speedy fast Helloween style riffs. Celtic flavored lead guitar harmonies highlight a very "epic" sounding track. The Prince In The Scarlet Robe, another great track, uses big power chord riffing and an overall slower epic sound with some speedy sections. Eerie Sabbath overtones can be heard with the riffs and the orchestral drone in the background and the pummeling double bass drumming throughout is simply incredible. The vocals really shine here and the song has a great catchy chorus. Icarus Ascending, with it's Blind Guardian style of heaviness, reminds me a lot of Maiden's The Clansman with the vocal style. The vocal performances here are some of the best on the album and some Thin Lizzy flavored lead guitar harmonies are a nice touch. True Believer sees the band getting back to the more basic fast charging power metal sound that Domine is known for. More Maiden style riffs, fast double bass drumming and great vocals make for a solid tune. Included as a bonus track for the Japanese version of this album is a cover or Riot's Altar Of The King. A solid version of the song with the personal Domine touch. I loved Stormbringer Ruler and although there's a lot of bands playing this type of epic metal, Domine just seemed to "get it right" and produced a real gem of an epic true metal album. Emperor Of The Black Runes comes almost three years after that release and sees the band delivering a solid album much in the same vein but overall, the songs and band performances are not nearly as good. Fans of the band will find lots to like about the album, it's just that there's a few average songs and some of the vocals, solos and song arrangements are not up to par as well. I'm a little disappointed as I was expecting a killer album from these guys. It still has several killer tracks but all in all, Stormbringer Ruler still rules over this one.